With legumes, red meats, roasts, cured cheeses and greens. Red wines pair extremely well with these types of foods, both because of the taste resemblances and contrasts. More specifically, young red wines go down perfectly well with rice and pasta dishes, roasted white meat or white meat in sauce, as well as with semicured and mouldy cheeses. The Grandes Reservas are more recommended with roasted red meats, venison and cured savoury and spicy cheeses! 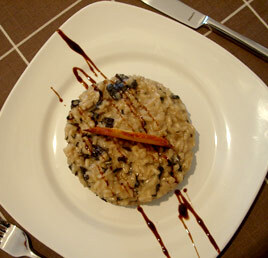 Its youth and blend of Cabernet Sauvignon, Merlot and Tempranillo make Bach Viña Estrísima the perfect wine for a large variety of dishes and particularly for a Mushroom risotto. A piece of advice: Keep the wine at a constant temperature of 14-18ºC to ensure that it reaches the table in optimum condition. Finely chop the onion and sauter it in a frying pan until golden. Add the rice and the white wine. Then add the mushrooms, (which have previously been left to soak in cold water for ten minutes) and stir. Add the hot broth and the water from the mushrooms as the rice absorbs it. When the rice is cooked, remove from the flame, add the butter and the cheese and stir it all together.